We have the MOST clients whose ideas went on to sell in stores! Since 1989, our family owned and operated company has been trusted by businesses and idea people around the world. Our founder, George Davison, and an inventor we helped on the Steve Harvey Show. Companies and “idea people” love working with Davison. Watch this tribute to inventors who are paving the way for innovation with their grit and brains. They are building a better tomorrow and so can you. Davison is a family owned and operated company and we work hard to earn our clients’ trust. By utilizing iron-clad confidentiality statements with our clients, Davison’s Inventing Method technology brings their ideas to life. Our focus is on consumer products, industrial products, apps and more! Some ideas are simple by design, and others are technologically advanced. Regardless of complexity, our professionals have the know-how and experience to provide invention help. We’ve been featured on the CBS Early Show, The History Channel, The Science Channel just to name a few that came to experience America’s largest invention factory. The media compares it to Willy Wonka & the Chocolate Factory. Part fantasy, part reality, it’s where our client’s new invention ideas come to life. All new product ideas start with trust. At Davison, we work hard to earn our clients’ trust by demonstrating prior client work through case studies that future customers can review. We can demonstrate our work on consumer products, apps, industrial, medical, pet, hardware, auto and more! Some products are simple by design, and others are technologically advanced. Even if your idea is an accidental invention, we can help. Complete the idea security agreement for a free confidential consultation. 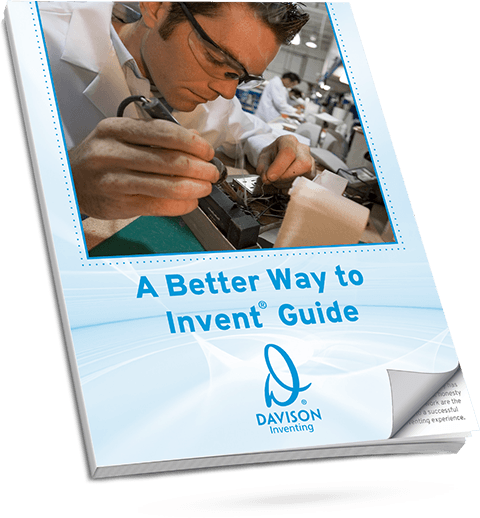 For almost 30 years, Davison has helped inventors prepare and present their ideas to corporations for possible product licensing. Our exclusive inventing method took many years to create and is now responsible for more client inventions that have sold in the market than any other organization in the country. George Davison is not only the founder but he is a successful inventor himself. Over the years he has invented products that have sold millions of units, achieved numerous patent awards, has become a television personality (History Channel, Science Channel, CBS, Lifetime Channel and more), and has been called a “creative genius” by Entrepreneur Magazine and featured in the Wall Street Journal. See his story here. We love seeing what people are coming up with as new ideas and inventions. We also love helping corporations with their new product needs. It is extremely satisfying to be able to bring the inventing and manufacturing community together for a common good. Our inventors get paid on every unit of their invention that is sold by the corporation and the corporation has new products for their customers. Everybody wins! The photo is of some of our actual clients who are holding their products that have sold in stores. They were not paid for taking this photo or their endorsement of our company. Our clients’ inventions have been licensed by corporations and sold by wholesalers, distributors, retailers, and online stores across the world. They have also won numerous awards and received national media attention. We understand you are concerned about confidentiality, and for this reason all of our employees are required to sign an Ethics and Confidentiality Agreement (ECA). This legally binding document protects the inventor and assures them that all who work here are bound to secrecy. This agreement lasts forever. In order for us to review your idea, we provide you with a signed Idea Security Agreement (ISA). The ISA adds another level of security to your idea’s confidentiality, and states that we will not sell, develop or license your idea without your written consent. The next step is your decision. We encourage you to complete our Idea Security Agreement, so one of our Project Managers can discuss your idea with you at no cost.